Yesterday afternoon a shocking murder suicide took place in Butler Street, Dudley Hill. 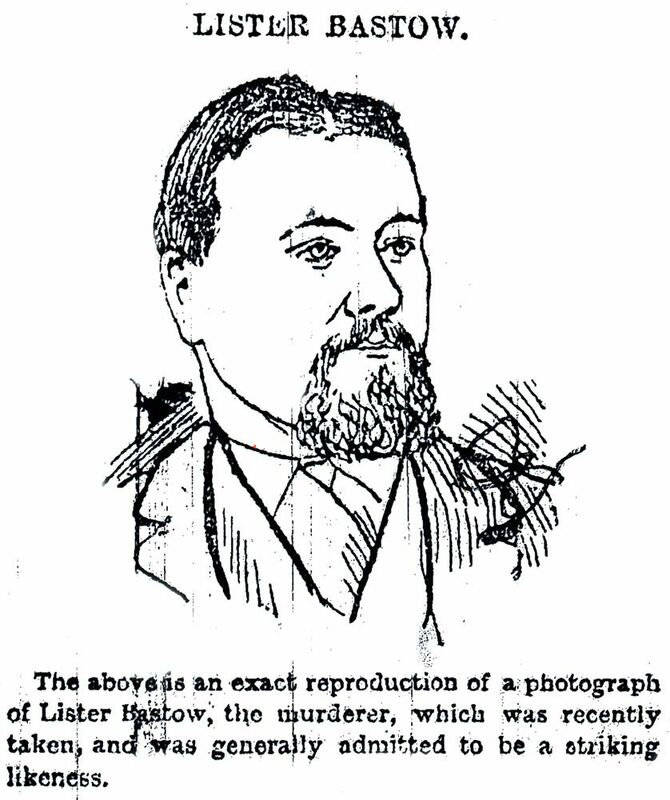 The culprit was named Lister Bastow, and resided with his wife and daughter, the latter a girl 16 years of age. It appears that the murderer, who was an elderly man, killed his wife and daughter by cutting both their throats in a horrible fashion, the head of the girl being nearly severed, presenting a horrible sight. 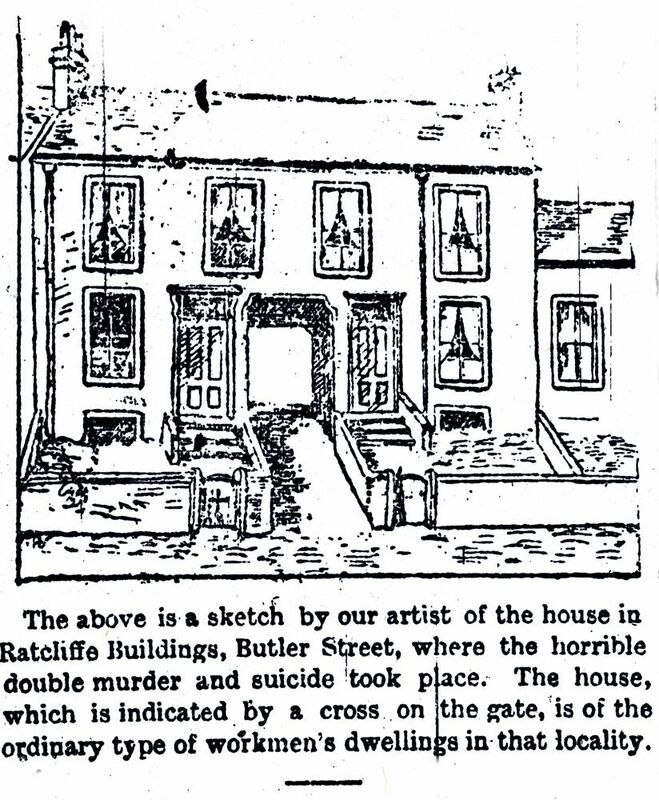 There were two young children in the children in the house at the time, and after he had committed the dreadful act he took his own life in the same way. The neighbours were soon aroused, and on entering the house a horrible sight presented itself. The West Riding police were at once communicated with. Bastow had not lived in the district for very long, and was a comparative stranger. He is said, however, to have the reputation of being a sober man, and had been employed by a firm of electrical engineers, of Tong Street. 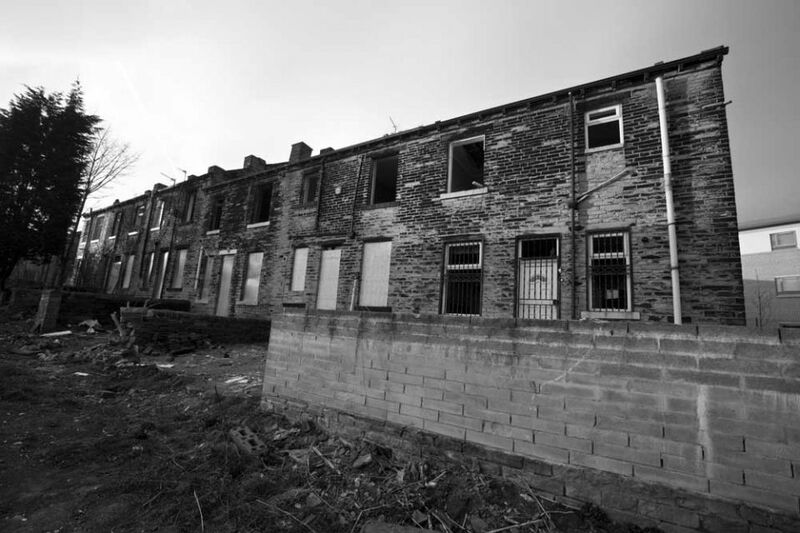 The occurrence generally became known to the neighbours, and caused tremendous excitement, crowds gathering in the vicinity of the street, which is a branch from Tong Street, and consists of ordinary working-class dwellings. The frightful deed was not discovered till about half-past three o’clock yesterday afternoon. The landlord of the block of houses, at the foot of Butler Street, Mr Chas Ratcliffe, had noticed that during the greater part of the day the house seemed strangely quiet, and betokened no signs of stirring inmates. The blinds remained drawn down at full length, and these and other circumstances strongly aroused his suspicions, and eventually he determined to inform the police. Sergeant Simpson, of the West Riding \police Force, who is stationed at Tong Street, Dudley Hill, happens to live in an adjoining block of houses, and it was to him that Mr Ratcliffe confided his suspicions. As soon as Sergeant Simpson had received the information he hurriedly went with the landlord to see the house. The first glimpse the sergeant caught of the house was sufficient to let him know that all was not right. He walked to the doorway, and raising the fanlight, looked inside. As the window of the interior of the house was in semi-darkness he could by no means obtain a distinct view. After a careful survey of the limited area open to his vision he saw what appeared to be a naked body lying near the door, and partially hidden by it. The body gave no indication of motion or life, and consequently he left to obtain further police assistance. Along with the landlord (Mr Ratcliffe) the sergeant went in search of a constable, and was fortunate to almost immediately come across P.C. Chesterton. The three men then wended their way backwards to the house in order to force an entrance. This was easily accomplished by the breaking of a cellar window. On doing this, three men met with no further obstacle, and proceeded straight away inside. They made their way to the doorway of Pricilla Bastow, the wife of Lister Bastow, in her nightdress. Her throat was fearfully cut and gashed, and she was laid in a large pool of blood. She was in a cramped position on her right side, with her right arm under her head. Her throat was cut almost from ear to ear, but more deeply and towards the right side. It was evident that the woman’s life had been taken. 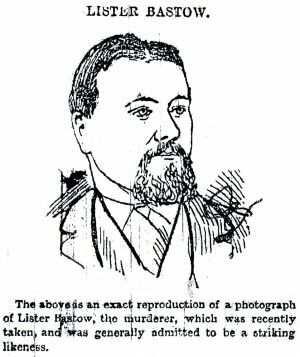 On the stair the men found the body of Alice Bastow, a girl of about fifteen years of age, and in front of the living-room the body of Lister Bastow. Both throats were cut from ear to ear. Alice Bastow was laid upon her right side, and her throat was fearfully cut on the right side. The jugular vein was completely severed. She was in her stocking feet, and had evidently just been roused from slumber when so horribly murdered. From her position it was evident that she had just risen from the bed, probably on hearing a quarrel between her parents. After this discovery the three men again retraced their steps and went to the front living room. There the body of the man Lister Bastow was found lying flat on his back. He had cut his throat from ear to ear, and to judge by his posture had done so in a most deliberate manner. He was laid near a table in the centre of the room, and his head was in the middle of a pool of blood. The body of Lister Bastow was not quite cold, and medical aid was immediately summoned. Doctor Brand arrived in a few minutes. He found the body of the man to be pretty warm, but the other two were stone-cold. From this and the postures of the bodies there could be no doubt that the man Bastow had, early in the morning, quarrelled with his wife, and while in the doorway deliberately cut her throat. She had deliberately offered some resistance, for it must have been the sounds of a scuffle that drew the attention of the daughter Alice, who had apparently just left bed to come to her mother’s aid. She had been sleeping in the upstairs bedroom along with two other young children, who on the arrival of the constables, were resting quietly in bed. The silence of the small hours of the morning was broken in the house of the Barstow’s by the shrill scream of the girl Alice, their eighteen year old daughter. Conversing with a “Telegraph” reporter in the evening, Mrs Briley, a next door neighbour, informed him of the fact. Though hearing the scream she said she thought nothing of the incident till the forenoon, when she noticed the blinds were still drawn. This roused uneasy feeling in Mrs Briley, who went and informed the landlord-Mr Charles Ratcliffe, who lives next door, at the bottom of the street. He took the steps which he described personally in an interview which will be found detailed below. What time did you go and tell Mr Ratcliffe? Inquired our reporter – About dinner time. What did he do? – He went to Drighlington first to her mother’s and when he got back he broke into the house with Sergeant Simpson. What time would that be? – About four o’clock this afternoon. Then between three o’clock this morning and four o’clock this afternoon no one attempted to enter the house? – No. Had you ever heard them quarrelling? – Oh yes; nearly every night since they came. How long have they lived in the street? – Oh, short of twelve months. What sort of people were they? – Oh, they didn’t mix much with the neighbours. Do you know the cause of the quarrelling? – Well, he has been a man who did not like work, and I fancy that had something to do with it. Here the conversation was interrupted by another neighbour who volunteered the information that the Bastow’s had been married 17 years. Has Bastow been a jealous man? Asked our representative – Oh, he was shocking. She told me her-self. She said he had been jealous ever since the first day they were married. Had he any cause for jealousy, do you think? – Oh, dear no, there could not be a nicer or more upright woman. The old lady could not accompany Mr Ratcliffe back, neither could her daughter. Perforce, therefore, he returned alone, and alarming Sergeant Simpson, broke into the house by one of the lower windows. Mr Ratcliffe’s feelings were not quite under control, and seeing the body of the woman behind the door refrained from entering. How long had the Bastow’s been your tenants? Mr Ratcliffe was asked – They’ve been here from about March 18th last year. Have they been good tenants? – I’ve had no bother till just lately, when I’d a bit about the rent. How was it you did not enter the house before? – Well the oldest girl drew her wage and left her wage and left her work yesterday dinnertime, and I understood they were going to Mrs Bastow’s mothers. I thought they might have gone, as the blinds were down, so I went to see if they were there. A “Telegraph” reporter chanced to get into conversation with an acquaintance of Bastow’s at Dudley Hill Station. He had been in the habit of visiting Bastow’s house every Saturday night, and had seen nothing wrong with the man and the relations between him and his wife appeared to be one of the most amicable nature. To his three children he was as kind as a father could possibly be, but during the last few weeks he appeared to be a trifle depressed. He had, he understood, a dispute with his employers, and, it is said, had been dismissed since that time, and a number of weeks ago his demeanour had undergone a change. Bastow was of a temperate habits. Last evening, another “Telegraph” reporter interviewed a Mr and Mrs Nicholls, who live in the house immediately in the rear of the Bastow’s. The husband was then at work at Brearley’s mill as overlooker in the weaving department. Bastow was quick tempered and occasionally quarrelled with his wife. Of late, however, he had treated her well. Bastow preferred to go about dressed rather than work. He would, in fact, liked to have been a gentleman, but could not. The murdered woman was considered good-looking, but did not mix much with the neighbours. Bastow was a Bradford man, and his mother lives in Fitzgerald Street, Bradford. His brother keeps a grocer’s shop in the town. Bastow’s wife came from Drighlington, where her mother, Mrs Whitehead, still resides. For a time he and his wife lived apart. About last Easter they were reconciled, and Bastow took the house in Butler Street, where they have since lived together. The children lived during the separation of their parents with their grandmother at Drighlington, but the whole family was reunited upon the reconciliation of husband and wife. Bastow had been employed by Messrs Walter Brearley and Sons, stuff manufacturers, Prospect Mills, Tong Street. Some time ago, however, he lost his work, but he afterwards succeeded in obtaining employment from a firm of electrical engineers in Bradford. Whilst following this employment he is said, but this is not altogether believed, to have broken a lot of glasses, and to have had to work for nine weeks without wages in order to make up the damage. At the end of that time – not quite three weeks ago – he was dismissed, and he has since been out of work. His wife has taken in a little washing, and the eldest daughter worked as a weaver at Messrs Brearley and Sons’ mills until the day preceding the murder. The two younger children attended Tong Street National School, and on Sunday the Holme Lane Congregational Sunday School and Chapel. It is said that Bastow owed about £5 for the rent, and on Monday last the bailiffs entered the house, which was nicely furnished, and took part of the contents. Very little furniture was left for the use of the family, and Mrs Bastow has since had to decline to undertake washing from want of the proper utensils. She seems to have made up her mind again to separate from her husband, and she intended to leave with her children and again take up her abode with her mother at Drighlington yesterday. Her husband is said to have been against this. A pool of blood in the bed leaves no doubt that Bastow first cut his wife’s throat whilst she was lying there. As he had not severed the arteries it is supposed that she got up and made her escape downstairs. Indications of this are to be found in finger prints of blood on the bed-room door. The police are of opinion that the woman actually succeeded in opening the door leading into the garden, but that she was pulled back again. The footprints of Bastow’s blood stained socks are to be seen in the bedroom and on the stairs. According to medical opinion, the girl Alice probably died first and the mother afterwards, and at the time of the discovery of their bodies the appearances pointed to both having been dead some ten or twelve hours. Rigor mortis had set in both cases, and was especially marked in that of the daughter. Bastow’s body was still warm, and life had probably not been extinct more than an hour, or two. The place which he had occupied in bed was warm, and it does not seem possible to escape the conclusion that after murdering his wife and daughter he had gone back to bed and remained there for some hours. He had washed the blood from his hands at the sink at the cellar head; where marks of blood were found in the wash basin and on the towel. 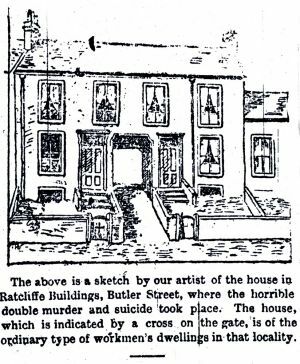 It is believed that he was alive and in the house at the time when the coal hawker tried the door, and it is supposed that he committed suicide shortly afterwards. 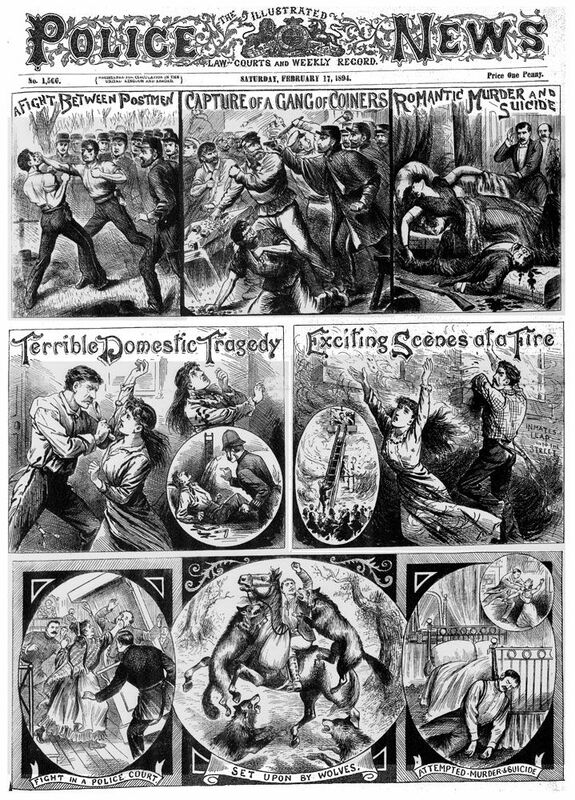 The excitement created yesterday in the Dudley Hill district by the fearful tragedy which ended in the murder of a mother and daughter, Mrs and Miss Alice Bastow, and the suicide of the murderer, Lister Bastow, the husband and father, has a bated but little, and the circumstances connected with the crime form sole topic of conversation in Butler Street and surrounding thoroughfares. Groups of people gaze upon the exterior of the house, which no one is allowed to enter with the exception of relatives and the police. The bodies of the unfortunate victims and that of Bastow have been laid out for burial. The three are laid side by side in the room downstairs. The interment will take place the day after the inquest. The blood which splattered the staircase walls has been removed and the apartments put in order. A brother of the deceased woman, who was a daughter of the late Thomas Whitehead, colliery wright, Drighlington, has arrived from that place, and is making the necessary preparations for the funeral of his sister and niece. The bodies are to be conveyed to Drighlington, Mrs Bastow having been born there, and laid to rest in the churchyard. The husband, it is expected will be buried in Bradford. It is now quite evident that after depriving his wife and daughter of life, Bastow washed himself, locked the two young children whom he had spared into their bedroom, and coolly went to bed, where he had remained for hours. Once or twice, however, the children state he entered their room and spoke to them but offered them no food. That this is correct is borne out by the fact that traces of blood-stained feet were found upon the floor of the apartment. All the daylong the little ones played about the room without the faintest idea of the fate that had befallen their mother and sister. Shortly after dinner-time Bastow had taken his own life. He had in his possession two razors, and these were got lying by his side when he was discovered dead at the foot of his bed. 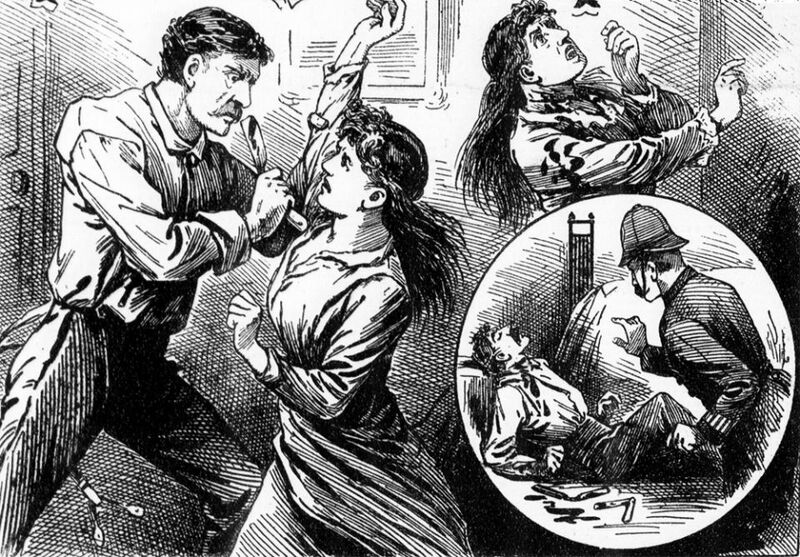 Besides cutting his wife’s throat he had stabbed her frequently in the breast. The bed in which the couple slept was saturated with blood, and proves that Mrs Bastow was first attacked in bed, but managed to escape and was pursued and caught by her husband. The daughter Alice had been easily overpowered. The house is almost barren of furniture. On Thursday a “Telegraph” reporter called on Mrs Bastow, the mother of the unfortunate Lister Bastow. She resides in a comfortable house in Fitzgerald Street, along with two of her daughters. There are other three members of the family, a married daughter who resides out of town, a son in Nottingham,, in a good position, and another son, married and doing well as a grocer in Bradford. A homely and good looking woman, Mrs Bastow is almost beside her-self with grief at the awful crime committed by her son. Was Lister getting on in years? queried our representative. He was born on the 1st of February, 1852, so that will just make him 42 years of age. He married Priscilla Whitehead, daughter of Thos. Whitehead, and the wedding took place in Kirkgate Chapel, Bradford, 17 years ago. At that time they were a happy couple. Was Lister of temperate habits? – Oh, yes; he had never during his whole life been given to taking too much strong drink. He was of an exceedingly quiet disposition and not easily angered, and he was so fond of his wife and children. It has been said that he was inclined to idleness. Yes, and it was his only fault. He received a good bringing up, but never seemed inclined to work much. Is it the case that the couple were separated? Yes, they resided at Eccleshill for a number of years, and during a considerable portion of that period Lister was out of work. Two or three years ago, in consequence of being unable to support a home, he came and lived with me, his wife and children going to Drighlington, where they resided with their mother. 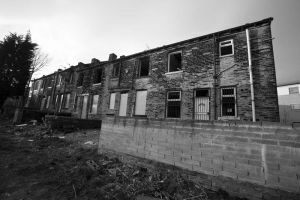 After two years they went to live together at Eccleshill, and on his securing work at Brierley’s Mill, they removed to Butler Street eight months ago. Three months since he fell out of work. How did he lose his place? It came about in this way. Lister was not well and unable to go to work, and he sent word to his master to that effect and asked him to engage another man for a few days. He took in a man in Lister’s place, but refused to let my son start when he was well. Since then he has done little, and I am afraid he was not over anxious to get a job. How do you account for the terrible crime he has committed? All through poverty and the threat his wife had made to leave him and go back to her mother’s house. They must have quarrelled during the night about it, and before allowing her to leave him he had taken her life. He must have been insane, for he was always a harmless lad. Had he any cause to be jealous of his wife? None in the least, I have never known them quarrel. She was a highly respectable woman, and made him a good wife. I have not been in the house for months, but I knew they were in great need. Further inquiries elicit additional information as to the idleness of Bastow. An Eccleshill man says he has known him for nearly a score of years, and he was always notorious for his lazy habits. His wife use to urge him to go to work, but he steadily refused until compelled by the prospect of starvation. Bastow was not as kind to his wife as he might have been, and more than once she was seen with marks of his violence on her face. She evidently bore his ill treatment without a murmur. Until a few weeks ago Bastow had been in the habit of visiting a Dudley Hill barber’s shop three times a week. There he would sit for hours, and never troubled himself about work, his cry being that his daughter Alice was a capital worker. It is also stated that when he had work he frequently lost it through lying in bed reading books. The little girl Jane, aged eight years, made a statement to her uncle last night. It is to the effect that during the night her sister Alice awoke her by getting up and going out. On the landing she met her father, who asked her something. Alice replied that “she would not,” and just after there was a heavy fall and stifled cries. Next morning her father came in to them, but would not let them out. He was very gloomy, and said nothing when they asked about mother. He came several times during the day. They were frightened, because they saw blood coming in under the door. Last night, in the Holme Lane Hotel, Dudley Hill, Mr Thomas Taylor, coroner in the Wakefield district, presided over an inquest into the circumstances attending the details of Lister Bastow, of Butler Street, his wife Priscilla, and his daughter Alice. The two latter were killed by the former, who afterwards committed suicide. The jury having been sworn, went and viewed the bodies of the deceased. Mr Abraham Elsworth acted as foreman. Superintendent Crawshaw watched the inquiry on behalf of the West Riding police authorities. But we heard at home that Lister would not work for them. A Juryman: I suppose you did not visit the house because of his treatment of your sister and the children? – Yes, and more than that, he pushed my mother and I out when we visited him at Eccleshill. What did he say to your mother? – He said that he would not talk to her. This was on Sunday before a Bank Holiday. The Coroner: Did he seem as if he had rational understanding? – Oh, yes. I asked what she intended doing, because she had told me that if her husband broke up another home she would never live with him again. She was at first almost unable to speak, but latterly said she was going to Drighlington with her family. She cried bitterly, and I said “You seem put about to leave him,” and she replied – Yes, I am, he has not a friend in the world. I asked her what Bastow intended doing. She answered that he could stop in the house a fortnight, when their notice was up, but after that she did not know what he would do. I believe they had lived a very disagreeable life for months past. After she left my house I never saw her alive again. John Thomas Brearley, stuff manufacturer, Butler Street, said he had been acquainted with the Bastow’s for about a twelve month. He saw Alice leave his mill about four o’clock on Tuesday afternoon. She appeared bright and cheerful, but it was evident she was in trouble. Lister Bastow was weaving overlooker in his place for about six months. Witness’s father dismissed him. The weavers formed a deputation and came to his parent and said they would not work under him because he (Bastow) was impudent and indolent. Ever since they came to live in Butler Street Bastow had quarrelled with his wife. The rows between them generally occurred about midnight. Witness had heard Mrs Bastow cry to her husband. Immediately after that he heard the children’s bedroom door closed. He next heard footsteps going into the other bedroom, and concluded that Bastow had been up. The latter appeared to walk once round the apartment, and then get to bed, as all afterwards became still. He felt apprehensive that something had happened. Towards eight in the morning he heard the two youngest children, Janie and Tom, talking in bed as if playing. Half an hour later he heard Tom cry out “Ma,” but the mother never answered. Alice had gone dozens of times to her work as if she had cried much during the night. Bastow appeared to have a nasty temper. By a juryman: The father was anything but a good worker, but the daughter was a smart hand and nice girl. In the bedroom they discovered Bastow lying upon his face, clad only in his shirt and socks. A razor was placed open on either side of him. His watch was found on the mantel piece with blood inside the case. The two little children were found in the small bedroom and conveyed to the landlord’s house, where they were taken care of. The parents’ bed was covered with blood, as were also several female garments in the room. The upper cut was three inches and a half in length and penetrated through the skin to the top of the windpipe. An inch to the left of the top wound was the second cut, extending down for five and a half inches and almost reaching to the top of the right lung. Death must have ensued within two minutes after the wounds had been inflicted. Either of the razors produced would be sufficient to make the wounds sustained by either of the deceased. Cuts were visible in both the girl’s hands as if they had been put up to save her throat. The Coroner having summed up, the jury, after consultation, returned a verdict of “Wilful murder” against Bastow, and found a verdict of felo de se in his case. To-day the remains of Lister Bastow, his wife and daughter were consigned to the grave. The husband interred in Scholemoor cemetery, and the mother and daughter at Drighlington. Bastow’s funeral was conducted in a private manner. The body was removed from his late residence in Butler Street at a late hour last night and conveyed to his mother’s house in Fitzgerald Street. This morning at ten o’clock, the coffin was placed in a hearse, which was followed by two cabs containing the deceased’s relatives. With the exception of a small crowd that gathered when the hearse stopped at the door, the funeral attracted no attention. Many persons, mostly women and children congregated in Butler Street, however, with the view of witnessing the removal of the remains, and they appeared disappointed when informed that the body had been taken to his mother’s residence the previous evening.